Hanukkah: it’s all in the numbers. 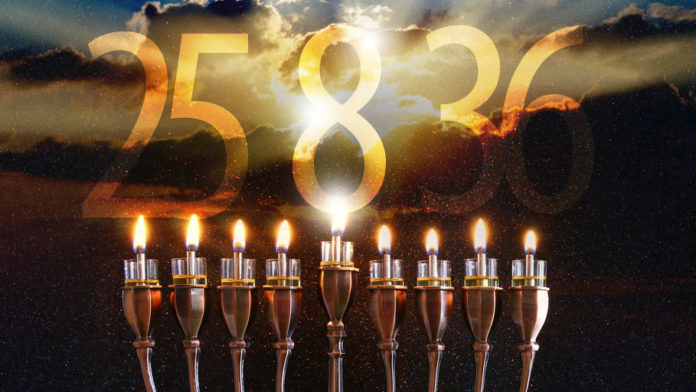 There are certain numbers which are strikingly conspicuous during Hanukkah. They are not there by chance. They contain important symbolisms which help us understand what the holiday is all about. Eight is of course the all-pervasive number of Hanukkah. Let’s look at a few examples and discuss their significance. When the Maccabees rededicated the Temple and came to light the Menorah, they found only enough pure oil to burn for one night, but miraculously, it lasted for 8. To commemorate, we celebrate Hanukkah for 8 days, lighting candles for 8 nights. At the time of the miracle, 8 days were required to retrieve new oil for the Menorah. The miracle occurred with shemen = oil, which is almost the same word as shemonah = eight. The priestly family which spearheaded the rebellion against the Greeks was known as the Chashmonai family. This consists of the Hebrew letter ‘het’, of numerical value 8, plus the word shemonah, which means 8. A circumcision is held on the 8th day of a baby boy’s life. This is one of the Jewish practices the Greeks forbade. The original Tabernacle of the desert was dedicated in an 8-day ceremony (see Exodus 29 and Leviticus 8-9). After the dedication, God tells Aaron that his lighting of the Menorah is the most precious service of all (Rashi, Numbers 8:2). In the miraculous End of Days, there will be 8 unique notes in an octave instead of 7 (Talmud Erchin 13b). In Jewish thought, the numbers 6, 7 and 8 represent a progression. Six stands for the physical universe. It corresponds to the four directions – north, south, east, and west – together with up and down. Seven represents holiness – the non-physical element of the universe. Shabbat is the seventh day of the week, the day on which God “rested” and no longer needed to add to the physical world. It reflects that the world is not only a physical entity, but houses spirituality within it. Eight is the number beyond this, and so, represents transcending the physical universe. A baby is circumcised on the eighth day symbolizing that the Jewish people are not merely creatures of the physical world, dedicated to its pleasures. We devote ourselves to something higher. Likewise in the Temple we serve a transcendent God. The battle between the Seleucid-Greeks and the Jews revolved around this number. The Hellenistic culture was well ahead of its time in its appreciation of all things beautiful – art, architecture, sports, poetry, philosophy, rhetoric, etc. But for the most part, their admiration extended no further than the physical – beautiful bodies, sports achievements, massive coliseums, scientific endeavor, development of the human intellect. Even their gods were no more than human supermen, possessing all the pettiness and jealousies of ordinary man. The Greeks likewise tolerated Jewish culture and even our beautiful Temple – which they never sought to destroy. But they could not countenance performing Temple service to an infinite, incorporeal God or the mutilation of the human body via circumcision. To them, religion served to enhance and dignify man’s physical well-being, not to submit himself to a higher purpose. Circumcision was thus forbidden, and the Temple service could only be performed to the physical Greek deities. When the Maccabees stood up for Jewish religion and values, it was a battle of eight. The Greeks, for all their cultural advancement, lived for the physical world. The pious Jews recognized that Hellenism, in all its beauty, was superficial and dead. And they stood for something higher, for a religion which requires us to reach beyond the physical world and connect to the infinite – the realm of eight. They thus went beyond their natural physical limitations in taking on the most advanced army of the ancient world. And God rewarded them in kind – with olive oil which exceeded its own physical bounds to burn for eight days. You are bound to gain 8 pounds eating latkes, sufganiyot, and Hanukkah cookies over the course of the holiday. And just as the candles, your weight will go up one pound a day (hopefully that is, and not more). There are (at least) 8 ways of spelling the word Chanukah… er, Hanukkah, in English. Hanukkah begins on the 25th day of Kislev. It is the day the Maccabees rededicated the Temple. The Hebrew word Hanukkah can be understood to mean “they encamped (i.e., the army rested) on the 25th” (“chanu kaf-hei”). The construction of the Tabernacle items – such as the Ark, Menorah, beams, and curtains – was completed on 25 Kislev (Bamidbar Rabbah 13:2). The Second Temple was dedicated on the 24th of Kislev (Haggai 2:18) and this was no doubt celebrated on the next day. Rosh Hashanah, the world’s birthday, commemorates the creation of man on the sixth day of creation. Counting backwards five days, this would mean day one of creation occurred on the 25th of Elul. The 25th word of the Torah is “ohr” (light) – a possible allusion to the Hanukkah miracle. When the Children of Israel traveled in the desert, their 25th place of encampment was named “Chashmonah” (Numbers 33:29) – strikingly similar to the Chashmonai family of Hanukkah, which likewise “camped” on the 25th of Kislev, after their victory. The sentence “Shema Yisrael…” (“Hear, oh Israel,” Deut. 6:4), in which we declare our allegiance to God, contains 25 letters. Twenty five thus represents consecration – dedicating ourselves to a higher mission. Perhaps this is alluded to in its value. Twenty six is the numerical value of God’s name, the Tetragrammaton. Twenty five represents the initial dedication which leads us to devoting ourselves to God. The word “light” in all its conjugations appears 36 times in the Torah (the Pentateuch). There are six primary sefirot (emanations of God’s influence) which influence the world. (Although there are really a total of ten sefirot, the higher ones are considered too lofty for man’s direct comprehension.) Kabbalists divide each of these into six primary components, totaling 36 emanations. The original light of creation, known as the “ohr ha’ganuz”, shined for 36 hours before God hid it away for the righteous in the World to Come. This total of 36 is based on the fact that God created light on the first day, but only placed the sun and heavenly bodies in their positions on the fourth (Genesis 1:14-19). Thus, for the first 3 days – with 12×3 hours of daylight – God’s own light shone throughout the world unadulterated. There are 36 hidden righteous souls in each generation, who “receive the Divine Presence every day” (Talmud Sukkah 45b). There are 36 tractates in the Babylonian Talmud. Thirty six thus represents the deeper aspects to the Torah and universe – the Talmud and the wisdom of Kabbalah, and the divine light with which we can comprehend the infinite. When we light the Hanukkah candles, we receive the slightest glimmer of the original holy light of creation. Pious Jews throughout the ages would do nothing but gaze at their Hanukkah lights, drinking up their holy glow. Hanukkah too grants us the opportunity to perceive the light of God’s wisdom like no other time. Dovid Rosenfeld, a native of the Washington, D.C. area, works both as a programmer for aish.com and as a responder for its Ask the Rabbi service. He also serves as a volunteer writer for Torah.org. He lives with his wife and family in Ramat Beit Shemesh, Israel. Rabbi Rosenfeld’s son Zvi recently published his first book, The Ring of Fate, a riveting, fast-paced fantasy novel which is also completely kosher in both language and subject matter. It is available as both book and ebook. It is sold by Booklocker.com, as well as by Amazon.com and all the major on-line sellers.